We're on a roll here with the One Room Challenge and half way though the process, it's going so fast. If you're just following along, you can catch up with Week One and Week Two. This week was a little bit slower paced since I am at the Highpoint Furniture Show in North Carolina this week. 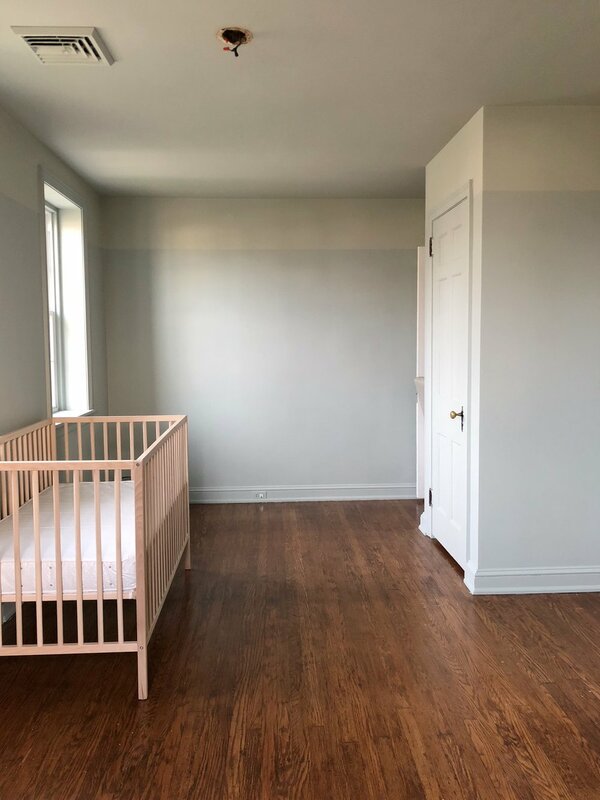 The homeowners assembled the Ikea SNIGLAR crib that we picked out a few weeks ago and the light wood tone looks gorgeous against the pale blue and green walls. Assembly was simple and the homeowners already had a mattress they had purchased. Jessica, the new mom-to-be had a bookshelf that her dad had built for one of her apartments here in Philadelphia. The piece was solid and has sentimental value so we're incorporating it into the space as a good spot to keep books and a few toys. The rocker is also going to be positioned next to it so it will be able to act as a spot to put a glass of water or other accoutrements. It's narrow enough that it will fit against that wall and we will float the rocker slightly in front of it. It was originally a stained, medium brown color and we decided to paint it to fit in better with the design of the room. 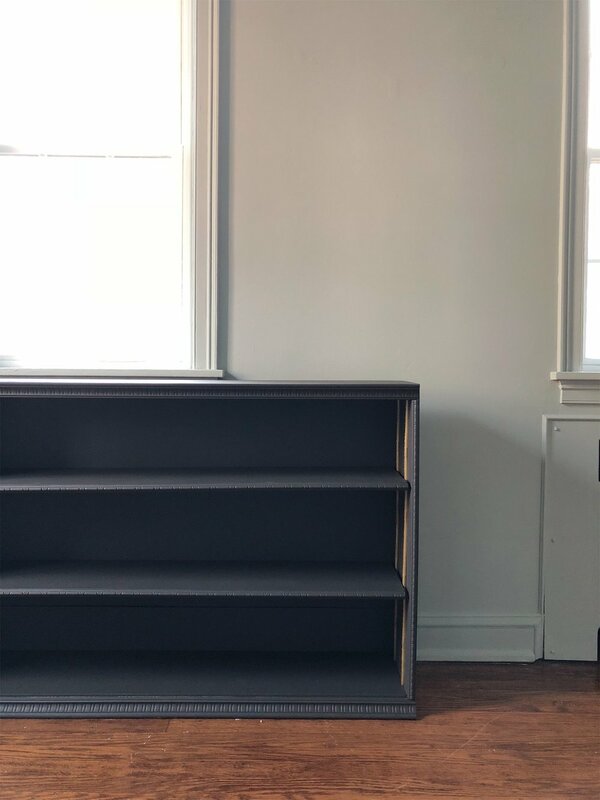 I chose Sherwin Williams "Black Fox" which is a warm, charcoal grey and will tie in well with some of the other accents in the room. The homeowners rolled a couple coats on and the piece was completely transformed to give it more of a modern vibe. The trim keeps still maintains a touch of the traditional feel which is perfect to tie in with some of the more traditional elements in the space. Here's a view from the entrance of the space so you can see how the pieces are starting to work together in the room. 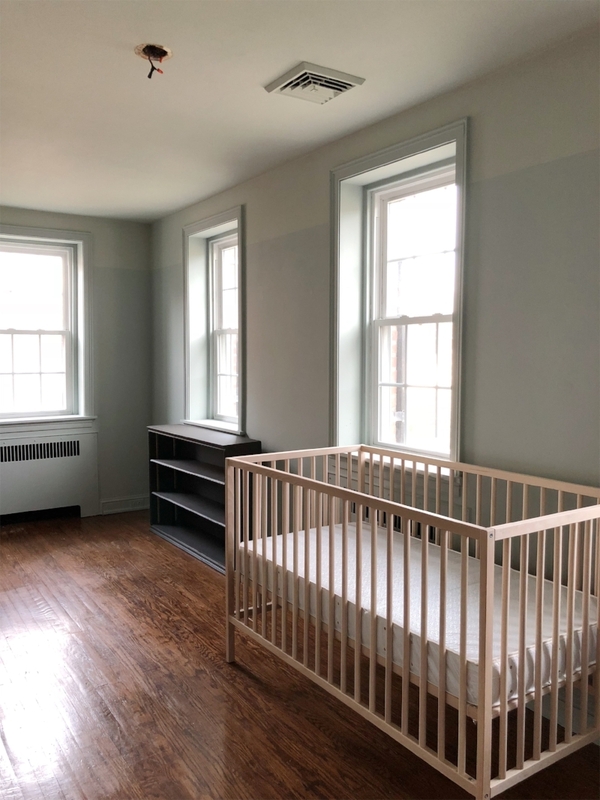 Next week we'll be installing the overhead light, rocker, and other lighting and then we'll get on to the exciting project of building that incredible built in daybed. Jessica's father is coming into the for the build next weekend so we'll be showing the process right before the final reveal. Stay tuned! Don't forget to follow all the awesome guest participants here. As well as the featured designers. Are you all stoked to start some project for the summer? :) Thanks for following along friends!